For Jeanne Bulmer and her mother Faye Slotnick, it was just another day of shopping. While others might go to the mall or bargain stores like TJ Maxx or Marshalls, Jeanne and Faye simply go out for a drive -- keeping their eyes open for garage sales, estate auctions or simply furniture that others are finished with. "One day we saw this beautiful couch, just sitting out on someone’s curb," Jeanne said. "It had been put out for the trash collectors." "Or for people like us," Faye added, trying to hold back her laughter. "The fabric was awful, but the bones of the piece were incredible," Jeanne continued. "We couldn’t let it get away." "So I sat there on that couch," Faye said with a satisfied grin, "out on the street -- until Jeanne went home and got her SUV." And there they were, two suburban women, well past the age of picking up furniture on the street -- trying to load a nine-foot couch into the back of a truck without creating too much of a scene. Some might call them the Thelma and Louise of home décor, but really Jeanne and Faye are just looking for furniture that needs a little love and another chance at life. Something the two of them know a whole lot about. Four years earlier, Jeanne had set out on an adventure. At 43, she traded in her well-established career in California real estate to live a more cosmopolitan life in London. But when she found out her mother was facing her third bout of cancer, Jeanne returned home -- with her new British husband in tow. Difficult as that transition was, it didn’t begin to compare to what would happen next. Just months after Jeanne had settled in, she was diagnosed with breast cancer herself: stage 3 breast cancer -- which, if undetected, can become terminal. "I was terrified, but I didn’t want to let on how scared I really was," she said. 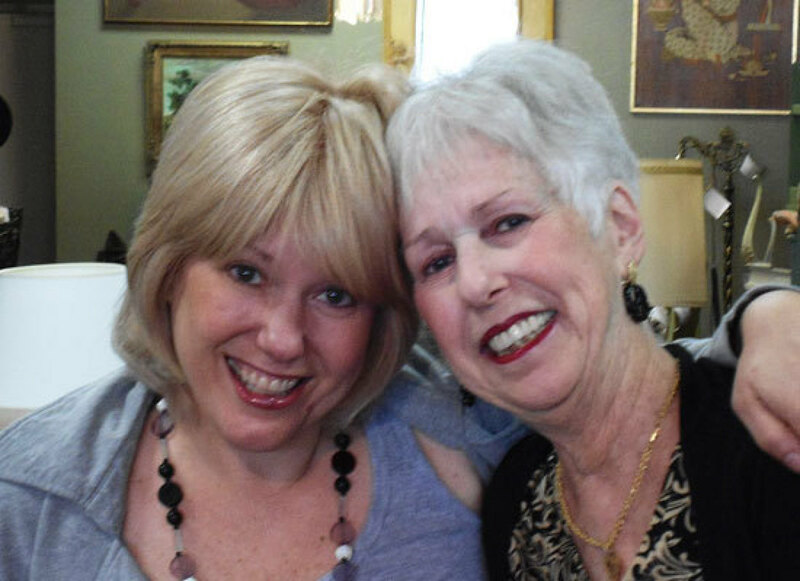 "If I saw stage 3 as a bad diagnosis, what would that say to my mom, who has stage 4 cancer? So I just kept moving." Kept moving would be a bit of an understatement. Jeanne had just begun a big job and bought a new home, so she was working full-time, straight through two surgeries and chemotherapy. She even continued to travel around the country for her employer. But somehow that didn’t seem to be enough. "I was humiliated. Up until that point, I'd never broken down. I didn't have time to break down. But I left the office in tears and sobbed the entire way home. I just kept thinking, I'm 48 years old and I'm coming off breast cancer treatment, who the hell is going to hire me? And at that moment I vowed that I would never be that vulnerable again. That I was going to rebound from this and create my own business." Soon after, Jeanne left the company and took some time off to concentrate on helping her mother and healing herself. They'd rest on opposite couches and watch HGTV -- indulging a passion they shared for home décor -- and fantasize about what they were going to do next, when they were well. "We needed to stay focused on the future," Jeanne said. "If we stayed in the moment, on those couches, we wouldn't have been able to push forward." As the mother and daughter continued with their treatments, Faye filled her time reading interior design magazines, losing herself in finishes and fabrics. And Jeanne flipped through business journals -- looking for entrepreneurial ideas. "Suddenly it all came together," Jeanne said. "I was reading about the resale business and Mom was sitting right next to me paging through pictures of couches and coffee tables. We were looking for something that didn't require a big investment and, in resale, the only inventory you need is what you take in on consignment from other people. "And I thought, 'That's it! We're going to restore and upcycle furniture. We'll find great pieces and reupholster them with beautiful fabrics -- and give them new life.' "
Jeannie went home and began putting together a business plan -- calling consignment shops around the country to gather information. In the meantime, as her husband was out walking the dog, he'd casually tell the neighbors what she was working on. Before Jeanne knew it, she had a garage full of furniture that neighbors wanted to sell in her store. A store, at that point, which only existed on paper. "We had to do it then!" she said, laughing. "I didn't want the neighbors to think I just wanted their furniture!" So she placed an ad on Craigslist, looking for a reupholsterer, and her husband Tony found the perfect location -- a 6,000-square-foot space in Canoga Park, that was once an interior design center. In between doctor's appointments, Jeannie and Faye would check out estate sales, wheel and deal at thrift stores and of course, every once and awhile, pick up a stray piece of furniture that seemed to call to them from the side of the road. It wasn't long before every inch of that showroom was filled with merchandise -- not just with couches and chairs, but with dining tables, entertainment centers and sparkling chandeliers. And the ladies hung a sign outside -- proudly calling their new store Rebound Furniture and Décor Consignment -- symbolizing not only their wares –- but their new lease on life. "Most people just give up on their old furniture," Faye said, "in the same way they may want to give up when they're given a bad diagnosis or when they just have some bad luck. But it's amazing what you can do when you're open to the possibilities." And the possibilities seem endless. In the three months that the store has been open, Jeanne and Faye have turned over their inventory four times. "Our dreams don't stop with just this store," Jeanne said. "We want to open others and offer franchises. We want to create jobs, make sure people have medical insurance -- and we want to raise money to help find a cure for breast cancer. "But most important," she said, taking her mother’s hand, "we want people to know that they can rebound." For more information on Rebound Furniture and Décor Consignment, you can visit http://reboundstores.com/. Known as the Thelma and Louise of Furniture, Jeanne (left) and Faye (right) find pieces that need a little love and attention and give them a second chance.